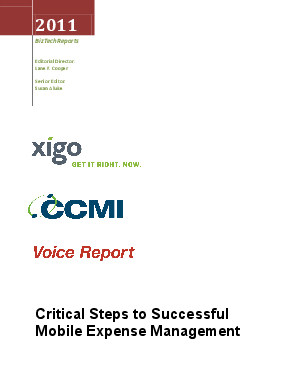 Learn more about the need for dynamic management of mobile expenses and how you can quickly implement a new strategy for immediate savings in this report produced by CCMI and created by Xigo. As enterprises confront an increasingly complex mobility environment, traditional telecom expense management approaches no longer adequately address the challenges of managing mobile expenses. A new approach to mobility expense management (MEM) by Xigo makes it easier than ever to achieve actionable results in minutes, not months or years. Because of the persistent challenges of MEM, enterprises need solutions that are robust, flexible, affordable and real-time. More and more, Software-as-a-Service (SaaS) solutions are gaining traction in the space because they address these requirements. Xigo has created a set of business rules that in essence triangulate the key elements of MEM -- the usage plan, device and inventory data detail -- and present the information back to the user in a meaningful format for a rational analysis.